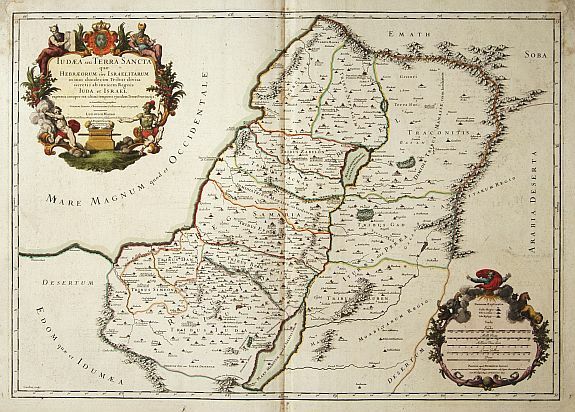 JAILLOT -Judaea seu Terra Sancta quae Hebraeorum sive Israelitarum..
JAILLOT,A.H. - Judaea seu Terra Sancta quae Hebraeorum sive Israelitarum..
Judaea seu Terra Sancta quae Hebraeorum sive Israelitarum.. - JAILLOT,A.H. Description :"Map of the Holy Land divided into the 12 Tribes of Israel on both sides of the Jordan, the shoreline running from Sidon to Gaza. Drawn after Guillaume Sanson. Engraved by Cordier. With two fine title cartouches; upper left cartouche surrounded by flowers shows at left Moses holding the Tables of the Law and at right Aaron with a sceptre. At the bottom right cartouche showing God above the clouds and different animals, among snakes. The date is marked ''169''"
Condition : Some minor marginal staining. In very good condition.